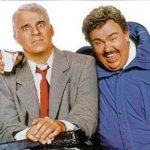 Where is Planes, Trains & Automobiles filmed? Steve Martin plays the bundle of nerves straight man Neal Page. John Candy portrays the innocent, but always getting it wrong, Del Griffith, a shower curtain ring salesman. The two of them are unexpectedly stuck together in a wild journey home during Thanksgiving. Look out for some incredibly funny scenes, especially the pillow and freeway scenes, in one of the best road movies ever made.